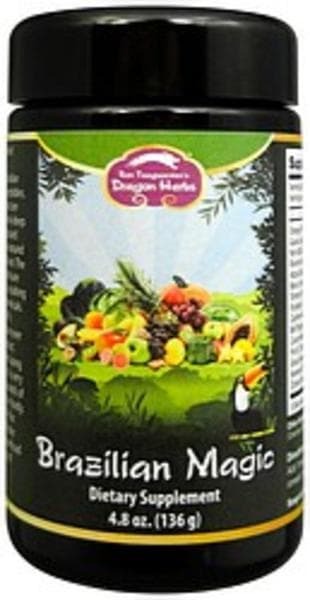 Brazilian Magic is a beautiful superfood powder made from 55 superfoods, garden vegetables, exotic fruits, superfruits and herbs. All of the ingredients are grown on the ultimate organic farm in the heartland of Brazil, a world away from civilization. Brazilian Magic is a unique superfood-herb based dietary supplement produced on a remote, super-pristine plantation in Brazil. The naturally grown vegetables, fruits and herbs used in this product are irrigated with pure water from a mile-deep aquifer, and Brazilian Magic is produced using this same pure water. The air around the plantation is 100% fresh and clean. The 55 vegetables, superfruits and herbs are naturally fermented for 6 months, resulting in an "alchemical" blend of phytochemicals. This product is raw, vegan and completely natural. It contains thousands of phytonutrients useful for the human body. Ingredients: Orange, pineapple, banana, apple, papaya, guava, spanish melon, brown rice, oat, non-gmo corn, barley, pea, jalo bean, roxinho bean, black sesame, millet, plum, adzuki bean, soy bean, carrot, rye, black bean, lentil, avocado, acerola, lemon, pear, tomato, red grape, mango, watermelon, pumpkin, sweet potato, chick pea, carambola, cashew nut, brazil nut, kiwi, cassava, green bell pepper, sugar beet, collard couve-manteiga (leaves), cabbage, passion fruit, chicory (leaves), west indian lemon grass (leaves), lotus root, turnip, nori seaweed, mate (leaves), cinnamon , anise, cloves (leaves), ginger (root), zedoary (root)usage:as a dietary supplement, 1 tsp once a day or as suggested by a health professional. Orange, pineapple, banana, apple, papaya, guava, spanish melon, brown rice, oat, non-gmo corn, barley, pea, jalo bean, roxinho bean, black sesame, millet, plum, adzuki bean, soy bean, carrot, rye, black bean, lentil, avocado, acerola, lemon, pear, tomato, red grape, mango, watermelon, pumpkin, sweet potato, chick pea, carambola, cashew nut, brazil nut, kiwi, cassava, green bell pepper, sugar beet, collard couve-manteiga (leaves), cabbage, passion fruit, chicory (leaves), west indian lemon grass (leaves), lotus root, turnip, nori seaweed, mate (leaves), cinnamon , anise, cloves (leaves), ginger (root), zedoary (root). As a dietary supplement, 1 tsp once a day or as suggested by a health professional. 36 tsp 3.4 g each.